Pariplay’s latest online pokie is the rather unique Jack in the Box. This pokie is named after its main bonus symbol which has variety of features attached to it. The game itself however takes place against a circus background. The full cast of characters is the ringmaster, a distinguished looking elephant, a lion and a bear. What will grab most players at first is the amazing reel layout which allows for up to 100 paylines to be activated. Pariplay have however limited the maximum wager per payline to 1 coin, which makes sense, but it would have been nice to have the option to make higher wagers with less paylines. The 1st and 6th reels have 3 rows, while the middle 4 reels have 4 rows. The 1st and 6th reels also activate one of the in-game bonus features so they do more than bookend the centre reels. The fact that there are 6 rows means that all in game symbols feature an additional 6 matched symbol payout. Pariplay have really made full use of the additional space this layout can afford. Even though the RTP is relatively low, around 95%, there is still a 25 000 coin jackpot on offer. When it comes to the bonus feature of this pokie you won’t be disappointed. Pariplay have managed to make use of familiar features that you have seen in many other pokies but in a unique way that gives Jack in the Box an original feel. The ringmaster serves as the game’s wild symbol. His smiling face will substitute itself for any of the standard reels symbols and you can even look out for a massive 4×4 version of the wild that appears on reels 2, 3, 4 and 5. 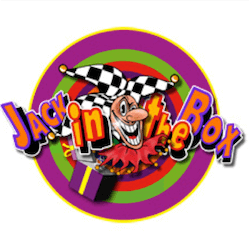 The Jack in the Box symbol from the game’s title is used in many ways here. It can either explode and turn into random symbols or if it lands on reels 1 and 6 it will take you to a pick me bonus game. Here you can pick from a number of Jack in the Box symbols and you need to attempt to match as many as you can. You can win a random cash prize or up to 20 free spins with a 2x multiplier or 10 free spins with a 5x multiplier. There is also a chance for 50 free spins with each Jack in the Box symbol that lands adding a 1x multiplier. Jack in the Box is another fun pokie from Pariplay and is live now.